I got a surprise message in my inbox the other day from a girl named Ali. She had heard about my blog through a friend and was interested in meeting up. She explained in her message that she’d been reading along, partly because “the journey of friendship is one of [her] favourite journeys.” I was really excited that she reached out. Today, we met for coffee and she is my stranger of the day. She was a little out of breath as she plonked herself down in the seat across from me. She had just biked to school in a sweater on a sunny day, taking it off and saying she wished she’d rethought the decision. She wore a string around her neck with an hourglass dangling from the end. Instead of taking an hour for the sand to pass, it only takes three seconds. Her boyfriend in Hawaii had found it laying on the beach. They would joke together about the fragility of time. Ali loves rock climbing, traveling, and funny breakfast mugs with bears on them. She grew up in Las Vegas. When she told me this, I just stared at her for a few moments, picturing what it would have been like to grow up in such a bustling, bright, and bold environment. She explained that she grew up more along its periphery and that it wasn’t anything too special. Her dad once told her that the best way to make friends is to ask people questions. “People love talking about themselves”, she said. 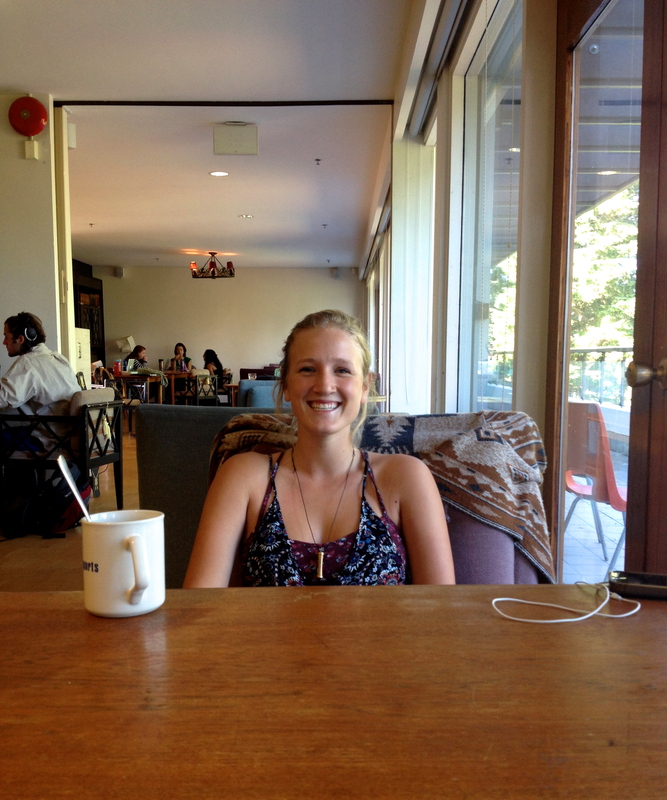 After moving to Vancouver to study Forestry at UBC, Ali fell in love with the outdoors. She recently heard about BC’s Big Tree Registry — a database where volunteers can keep track of the big trees in BC to protect them. She described hearing about the program from two little old men who were passionate about trees. Now, she wants to work toward protecting these trees when she graduates. Then we talked a bit about traveling. There was a pause, and we stared at each other for a moment before both bursting out in laughter. She explained why she’d asked but we continued to laugh at how futile her question had sounded. Last Summer, Ali traveled to Brazil — not for the world cup, but to work toward protecting the rights of indigenous communities. Ali’s Aunt founded an organization that works with the tribes to protect the culture and land. Ali recalled her journey to one of the villages, reminiscing her bird’s eye view of the way the land shifted so dramatically from an industrialized mess to quiet, pristine forests. She was awash with emotion just talking about it, in awe of the power we have to change the environments around us, and aware of the responsibility this entails. Ali also spent some time studying on the big Island in Hilo, Hawaii. She described Hilo as having the most interesting demographic of any place she’d ever been. Many people were living there temporarily from abroad, and yet all of these people seemed to be drawn to the area for different reasons. There didn’t seem to be any unifying thread between these people. And that, Ali explained, is what made it so interesting. She explained that the people there were very receptive to conversation, and that they would always have interesting stories to share. Her advice? “The best way to be happy is to learn about other people’s perspectives.” She explained that we sometimes find ourselves confused and frustrated by the actions of the people around us. But when we seek to understand their perspectives and their reasons for doing the things they do, we often find ourselves more at ease. “It’s the easiest way to be happy”, she said.